As today is St.David's Day, it was my mission to find some daffodils! I set off on my walk after school. This might seem like an easy task but believe me, it wasn't. I'll set the scene for you. I have just returned from a rugby weekend in Twickenham, a match which Ireland won!!!!! When my brain informed my body that I was going for a nice walk in the Spring air, my legs cried out in horror. All they wanted was a nice cosy bed. But I marched on...well, more of a stroll really! I knew that there had been "a host of golden daffodils" outside a neighbour's house last year, so I headed there. 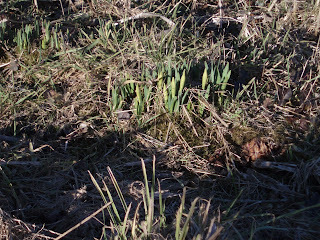 Alas, the snowdrops had made a glorious appearance, but the daffs had just managed to break the surface! Not to be deterred, I took a photo of what was there so far. I will monitor their progress over the next few weeks. What on earth is that mad one from down the road doing, taking a photo of......nothing??? ?